Bail has been denied to the ailing ex-principal of BRD Medical College Dr Rajiv Mishra and his wife, although documents do not indicate their culpability. While the Supreme Court will hear the bail plea of Dr Rajiv Mishra, former principal of Baba Raghav Das (BRD) Medical College and Hospital in Uttar Pradesh’s Gorakhpur, his family has alleged that the doctors are being victimised to shield the real culprits sitting in Lucknow. At least 30 children had died last year in BRD hospital allegedly because of the shortage of oxygen supply. It has been over nine months since Dr Mishra and his wife Dr Purnima Mishra, along with four staffers are languishing in jail without bail. Both were denied bail by the Allahabad High Court, which had said on April 30 – while declining to grant bail – that the “order for the release of the petitioner on bail cannot be passed in the present facts and circumstances of the matter”. Dr Rajiv is seriously unwell. Newsclick has accessed his medical record which says he is a heart patient with chronic liver cirrhosis (non-alcoholic). In addition, he is also suffering from Esophageal Varices (enlarged or swollen blood vessels in the esophagus). “My parents are senior doctors aged 60-plus and their health has been deteriorating so much that jail authorities had to admit my father at RML Hospital in Lucknow twice. He is struggling for his life. He had been in the ICU for two weeks. But there has been no relief even from the side of the court. 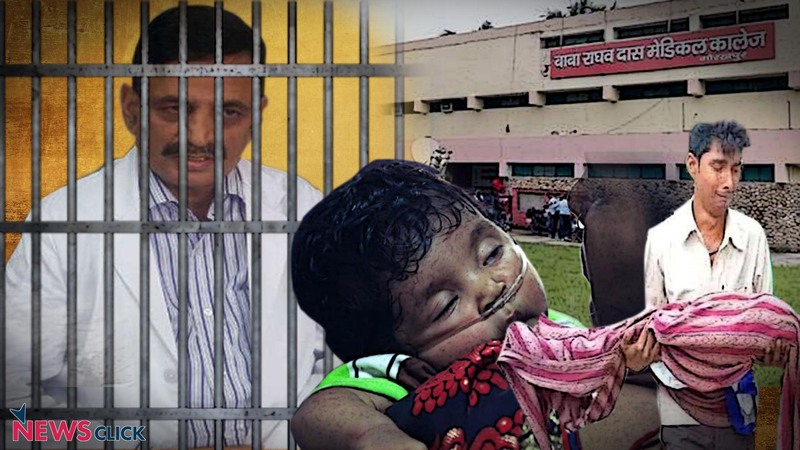 His medical condition is being ignored under the government’s pressure,” his son Dr Purak Mishra told Newsclick alleging that “the treatment in jail is also apathetic”. “We have been requesting proper medical care of my parents but even the recommendations by doctors are ignored. Apart from being physically unwell, they are being mentally tortured by keeping them with convicted criminals. It is as if everyone has decided that they are the culprits even before the court reaches any verdict,” he said. The enquiry in the case – he alleged – has been done under tremendous pressure and had a number of loopholes. The statements recorded were also “highly influenced”. “The doctors were arrested just to satisfy the collective media outburst and without any substantial prima facie evidence. My parents never got the chance to put forward their side of the story and evidence. They have not spoken out yet even once,” he said. The government in their counter, filed in the court, said Dr Purak has maintained that there was no shortage of oxygen and deaths were natural. “Then why has Dr Mishra been booked under 308?” he asks. He added that other corruption charges are also an attempt to divert the attention and make them scapegoats to save the higher official and the state failure. Dr Rajiv has been charged under sections 120B (criminal conspiracy), 308 (attempt to commit culpable homicide) and 409 (criminal breach of trust by public servant) of the Indian Penal Code (IPC) besides section 7/13 of the Prevention of Corruption Act. It has been alleged that the petitioner had stopped payment to the Lucknow-based company (Pushpa Sales), which used to supply oxygen for getting illegal kickbacks. As a result, the firm stopped oxygen supply that resulted in the tragic death of several children in the hospital on the intervening night of August 10-11. Dr Rajiv Mishra, being the principal, was head of the college and hence is being held morally responsible for the deaths of children. However, having a deeper look at his role will make it clear that he was just one of the signatories in the process of payments and cannot alone be held accountable. BRD had to clear a dues of over Rs 63 lakh (21 bills from November 23, 2016 to July 13, 2017) of Pushpa Sales, which had reportedly shot off several letters and reminders to the medical college and other authorities concerned such as the then Gorakhpur District Magistrate Rajiv Rautela, UP Government’s Principal Secretary for Medical Education Anita Jain Bhatnagar, Director General of Medical Education KK Gupta and even to Chief Minister Yogi Adityanath. But no payment was made. All these letters are in possession of Newsclick. The firm finally sent a legal notice – a copy of which is available with Newsclick – stating that the oxygen supply will be terminated if the payment is not made within 15 days. This notice was received by the medical college on August 2, 2017. The principal was constantly being threatened by the liquid oxygen supplier for its dues. He also wrote multiple reminder letters to the DM, the DGME and the principal secretary of the state health department, urging for the budget to be issued so that the dues can be cleared. But all these efforts met no response. All letters written by the principal are available with Newsclick. Dr Rajiv Mishra also informed the above mentioned high-ranking officials about dues in a conference call. Records also suggest that he had been convincing Pushpa Sales to not terminate the oxygen supply and wait for the govt. to issue the budget for dues. Earlier as well, when the agency threatened to terminate the supply, he had written to officials concerned and National Human Rights Commission to intervene and not let the company disrupt the crucial supply. Going by the records of the case, it appears that the government failed to provide an adequate budget to clear the dues of the supplier despite repeated letters sent by Dr Rajiv to higher officials. The first budget of Rs 1.24 crore for the financial year 2017-18 came to the BRD on April 21, 2017. The fund was allotted under the head of drugs and chemicals but there were orders from the government to pay for each item only from the budget allotted for it. It was also directed that bills of the last financial year (2017-18) will be paid only and no backlog dues will be cleared. The supplier was paid Rs 33 lakh in two instalments on May 7 and June 2 last year. The rest amount was spent on procurements of medicines and other necessary drugs and chemicals, the hospital needed. Newsclick has supporting documents in this regard. The second instalment of Rs 1.33 crore of the budget came on May 18, 2017. It was meant to be spent on 24-Hour Central Pathology Lab (POCT). Newsclick has a copy of the budget that clearly states that the money is supposed to be paid only to the pathology dues. The third instalment of funds was received by the BRD on e-mail on August 8, 2017, at 2:30 pm – a copy of which is available with Newsclick. It could be used only if the payment advice, which was sent through an e-mail, had reached the BRD in the form of a hard copy. It was received on August 9 (a day before the incident) when Chief Minister Yogi Adityanath was visiting the medical college. Soon after receiving the hard copy of the advice with regard to the funds, the principal signed and cleared the budget in time for the payment to the supplier. Tokens were released and the total payment was initiated which was credited in the bank account of Pushpa Sales in next 24 hours (on August 11, 2017). Notably, the payment was made within the 15-day period given by the supplier in its legal notice. The documents in this regard are available with Newsclick. A fund of Rs 250 lakh, allotted to the BRD on March 30, was lapsed and it has been referred by the police in the charge sheet against the principal. The payment backlog appears to arise because of this lapse, for which enquiry committee was set up by the principal. The committee report, accessed by Newsclick, clearly states that it was the fault of a clerk and DDO (drawing disbursing officer). “It is clear that there was no space of any delay, as largely projected by the government. The office of the DGME is responsible for the financial decisions of the hospital, including the issuance of the budget. If there is a delay in issuing the funds for the oxygen supplier despite a number of letters the company and the principal, shouldn’t the DGME be held responsible for that? The DGME did not give any response to the reminder letters and while he should have been probed for the same, he was made the main complainant in the case and he was also heading the enquiry committee. Under him, can the committee be expected to do a fair enquiry?” asked Dr Purak. Another shocking truth is that the principal was not even informed about the oxygen shortage. The oxygen staff was supposed to inform him when the level reaches down to 4500 mmwc (as per the contract, a copy of which is available with Newsclick), but there is no record available of any information being relayed to the principal. He – as the documents suggest – was never communicated about the shortage of liquid oxygen. “My father (the then principal) was first informed (about the shortage) on August 10 when the unfortunate incident of deaths happened after the level of oxygen had dropped to 900mmwc, which is extremely low. He had left for Rishikesh on official visit on August 10 morning as ordered by the DGME (a copy of the order is available with Newsclick) and he had delegated his responsibilities to the acting principal. It’s clear that he couldn’t have done anything at that time to control the situation,” said Dr Purak. As far as the case of Dr Purnima Mishra – wife of Dr Rajiv Mishra – is concerned, she was deployed at the BRD as the project officer of the clinical trial unit of the Central Council for Research in Homoeopathy. “She was neither directly associated with the BRD, nor has she got any financial power. Then how can she take interest in the administrative matters?” asks Purak. He says as the apex court says that a bail is a legal right and jail is an exception. Also, since the enquiry report has been filed long back and the investigation is closed, they (his parents) cannot influence it in any way. BRD medical college is the only hospital in an area of 200 km where encephalitis is rampant and primary health care is ignored. The city sees hundreds of deaths every year and the hospital functions on very limited resources and has been constantly facing apathy of government and officials. In such situation, how much a doctor can be held responsible for? Is the argument of moral responsibility of deaths valid when a person is not equipped to handle the number of cases that come?